Sniffling, sneezing, coughing, wheezing, red, watery eyes, or skin rash and other allergy symptoms, are a common cause of distress and illness for millions of people. You can't escape exposure to potential allergens because they're in the air, food, medicine, clothing, and products everyone uses. However, allergy testing can help you identify your specific allergen(s), which can then help guide your prevention strategy and treatment plan so you can get some relief. Whatever the source of your allergy, testing can often help pinpoint the culprit(s). Allergy testing is safe for both adults and children, is easy to do, and causes little or no discomfort. You will need minimal or no preparation before the test. Your specialist will explain how allergy testing works before testing you, and he will interpret the results of your test(s) in light of your history and physical exam to get a complete picture of your allergy. Be sure to check with your medical insurance company before you see a specialist to find out which tests they will cover. Your initial testing can occasionally be negative, even if you are allergic to that substance (false negative), or sometimes positive when you are not allergic (false positive). Your doctor will examine your history to interpret these results correctly or suggest other testing options. Skin testing is the primary method of allergy testing; it's convenient, reliable and inexpensive. The specialist's nurse usually performs the skin allergy tests. The various methods of skin testing have the following things in common. They use a small, concentrated amount of a standardized test allergen. They're usually done on the skin of the forearm or back. If different allergens are tested at the same visit, the nurse labels each skin test site with the name of the allergen before placing it. You are carefully observed for a skin reaction or other reactions. If you are allergic to a test substance, your body will respond and attack this substance. A positive skin reaction usually causes a raised, red itchy bump (a wheal) with surrounding redness or erythema (a flare) at the site of the test. A larger wheal and flare means a more severe allergy. Other reactions include a stuffy nose, sneezing, or red, watery eyes. Occasionally hives, difficulty breathing, or an anaphylactic reaction can occur. Each method uses a different technique to get the test allergen under the skin surface. The nurse, takes the following steps. She cleans the skin test area and marks the test site(s). She then places a small amount of an allergen at the site(s). Next, she pricks, scrapes or scratches the test site(s) with a needle (or lancet) so that the testing allergen gets under the skin. She then watches the site(s) carefully for a reaction to the allergen. Finally, she reads the results in about 15 to 20 minutes and measures and records the size of the skin reaction(s). The allergen is already coated on the device which is used to puncture the prepared skin test site. Results are read and recorded in 15 to 20 minutes, as described above. Prick, scrape, scratch, or puncture skin tests are used for allergens such as pollen, dust, pet dander, dust mites and food. The prick and puncture tests are performed more frequently than the scrape test. A small amount of allergen is injected just under the skin surface at the prepared, labeled site. The nurse reads the results in 15 to 20 minutes. The intradermal method is used to test for a specific allergy to penicillin and bee venom. This method can also be used if you strongly suspect that you are allergic to a specific substance even if the skin tests listed above turn out negative. There's also a greater risk of causing anaphylaxis with an intradermal test than with other methods of skin testing. The SET is also known as the serial endpoint titration test, or intradermal dilutional testing (IDT). Starting with a weak solution, increasing concentrations of the allergen are injected under the skin. The skin reaction is measured 10 minutes after injection. Testing is stopped at a concentration that causes a wheal of at least 13 millimeters in circumference. The SET point is the weakest concentration of allergen that caused the first positive wheal reaction. 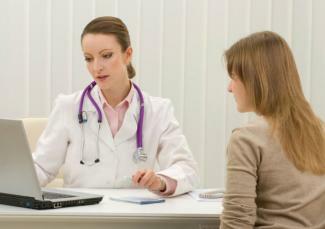 This test is useful for figuring out the safe dose of immunotherapy to give if your specialist chooses this treatment. It is primarily used to determine the degree of allergic reaction to yellow jackets, honey bees, hornets, wasps, and fire ants. Some people have a delayed response to an allergen. A patch test can identify a delayed response to allergens that cause a reaction on contact with skin (allergic contact dermatitis). 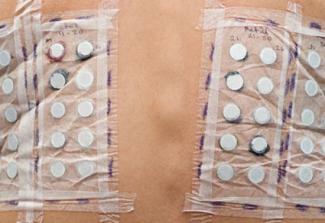 A testing patch with a potential allergen is taped to skin and left on for 48 hours. Multiple patches can be placed at carefully labelled sites. Avoid bathing or sweating during the testing period. You'll return to the specialist's office in 3 to 4 days so he can read the results. Patch tests usually include latex, fragrances, hair dyes, metals, fragrances, medications and preservatives. To make sure the skin testing is valid, two control solutions whose results are known are also tested at different skin sites. Glycerin: This acts as a negative control. Most people are not allergic to glycerin so the test site will be negative. Histamine: This acts as a positive control. Most people react to histamine; therefore, this test site will be positive. Histamine is one of the substances the body releases as part of an immune response to an allergen. Your test sites are compared to the control sites. 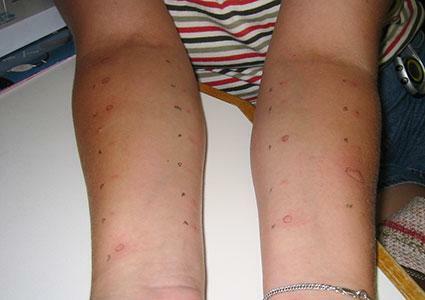 Your allergy testing may not be valid if you do not respond to the control solutions as expected, and your doctor may decide to test you in an alternate way. Your doctor might ask you to stop these medicines for a period before testing, if it is safe for you to do so. During a challenge test, you are given a small amount of allergen to swallow or inhale, and then you're observed for any type of allergic reaction. This type of test is performed when it is important to diagnose a food or medication allergy and your initial skin testing to a suspected allergen turned out negative. Your specialist might choose to perform blood testing in addition to, or instead of, skin testing to look for certain factors in your blood. An assistant will draw blood, usually from your arm, which requires a simple needle puncture. When you are exposed to an allergen your body labels as foreign to you, your body mounts an immune response and makes antibodies to ward off this substance. One group, IgE antibodies, can cause release of other substances that lead to the allergic reaction you get. 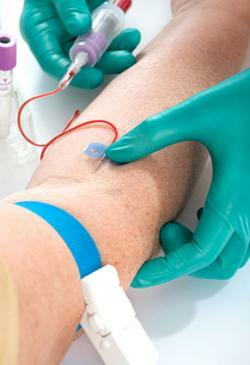 Allergy blood tests can detect and measure the amount of specific antibodies made in response to a specific allergen. The lab adds serum from your blood to known allergens. If you have antibodies in your blood to the antigen in the dish, your antibodies will bind to the antigen and cause a reaction. Radioallergosorbent Test (RAST): In this test, the IgE antibody bound to the allergen is identified by adding a radioactive label. Enzyme-linked Immunosorbent Test (ELISA): The IgE-allergen complex is identified by a fluorescent label. The ELISA is preferred because it is the safer, more sensitive in vitro test. Certain white blood cells called eosinophils can also increase during an immune response, and your specialist will measure the eosinophil count in your blood. Although eosinophils can increase in other situations, your doctor can use this result to help interpret your other test results. Blood testing is more expensive and less sensitive for identifying an allergen than skin testing, and you may not get your results for weeks. Allergies are common and can cause severe reactions and misery. There is no need to suffer because initial allergy testing is easy and safe when performed by a specialist, and he can use your results to design a treatment plan specifically for you. You can help your specialist by creating a list of everything you think you might be allergic to and being prepared to give him a detailed history.